Discussion in 'Cold Steel Knives' started by DuranX, Apr 13, 2019. I have been a huge fan of CS on fixed blades, have a few, but I have recently fallen in love with their folders as well. I purchased a couple of Code-4’s , like them a lot. Have my eyes on 4-Max but it may be a bit more knife than I need. No experience with the SR1, but the AD10 is a slightly smaller version of the 4-Max (4" vs 3.5" blade), while the SR1 is a completely different knife. Many people have also said the Ultimate Hunter is great substitute for the 4-Max and AD10. I have the 4-Max, AD10, and AD15, and the AD15 is the only one I would EDC. The 4-Max is way too big for me, and the AD10 isn't much smaller, but the AD15 gives you pretty much the same blade as the AD10 in a slimmer package that's easier to carry. jbmonkey, rycen and DocJD like this. Thank you for your response. 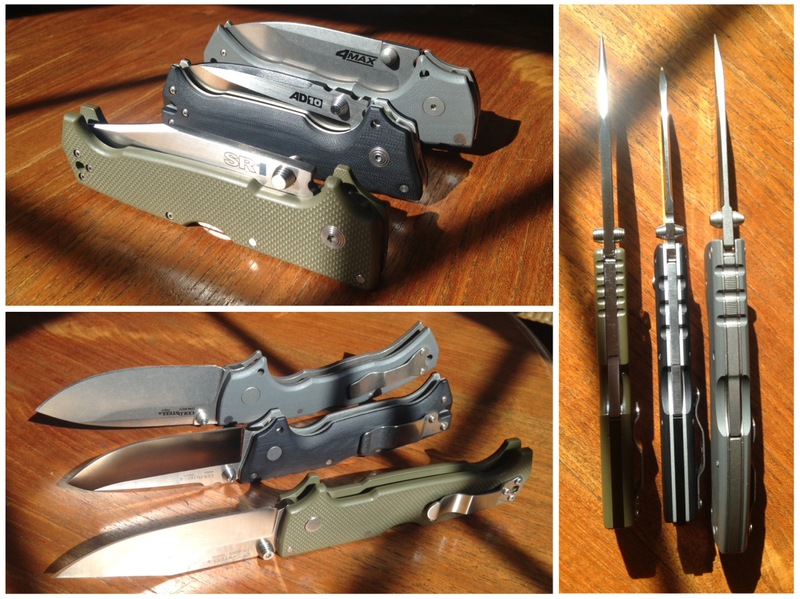 I am not necessarily looking for an EDC as much as a general outdoor heavy use knife,(besides a fixed blade). I won’t chop with it or anything but want a sort of a heavy user (for a folder), more to have on me just in case. Is SR1 bigger than AD10? Not seen an AD10 yet. SR1 is saber ground while AD-10 is hollow ground. So SR1 will hold up better to twisting, prying and chopping while the AD-10 will cut better. That's not to say that the AD-10 is fragile. Far from it. The AD-10 had fully contoured scales that are super comfortable. The SR1 uses slabs with a nice chamfer. They're comfortable too but less so. SR1 scales are aggressively textured. Lots of grip and they tear up your pocket. AD-10 scales are smoother. I like the SR1 the most and will be buying a back-up. For me, it has the best action, pocket clip, and blade for baton splitting wood (unlocked, start cut, micro wedge follow through). The narrow folded width makes it useful as a non lethal kubotan/palm stick/fist load (for aggressive dog control). The narrower blade is better for paring cuts, and finer point better for detail carving. The AD10 has a more comfortable grip, but the hollow ground blade gives me pause for hard use and the clip doesn't rest as well/securely on the curved handle surface. The AD10 and SR1 are otherwise about the same weight and folded length, yet the SR1 has the longer blade. The forward finger choil on SR1 is well spaced, but not so on the AD10 or 4max. Course the AD10 and 4Max make better slicers than the SR1, but that doesn't make much practical difference to me in my daily use, except perhaps when cutting apples in half. For me, whichever blade has been most recently sharpened seems to cut the best. The SR1 G10 was overly aggressive, but easily sanded to my tastes. All three also took some dremeling/sanding/filing to smooth some sharp edges/corners/surfaces here and there.... least, for my personal tastes. Just my $0.02, YMMV of course. Good luck on your choice... really can't go wrong with any of them. onionfan, nephron, d762nato and 2 others like this. I actually haven't considered the SR1 yet personally. The main thing about it seems to be that it is liner-less compared to the others right? Personally, I have plans to buy the AD10 and AD15 this year. SR1 has partial nested steel liners. It's a very strong knife. jbmonkey and jencarlos like this. Its got the nested steel liners around the stop pin, tri-ad lock and all the pins that make it. Insanely strong knife, would still be ridiculously strong without the nested liners due to the thickness of the G10. No doubt the SR1 is a stout knife. Actually I never even meant to call that into question. I’ve just been deciding on AD10 and AD15 for the looks really. have sr1, ad10, ad15, and 4 max. sr1 is my least favorite. it's got the worst of the bunch pocket clip. super tight with g10 super shred pockets texture. thick blade not real useful for many daily tasks, but in fairness a fella here was slicing apples with one, so it can cut. it's hardly as good as a slicer and daily user as the 4 max, or ad10 or ad15. only reason for the sr1 is cause one wants a thick and super touch folder but all cold steels are pretty much tough and strong for most tasks so the sr1 place isnt so much needed unless someone just wants it. all that said I still have one and sometimes carry it so if ya want it get it. the ad10 is the step down for the 4 max. on carry the 4 max I dont find it hard to carry....all relative of course. ad15 would also be a good choice for a smaller sort of 4 max. different as ya know but a good carry size and slicer/user. all my opinions others will differ, and that's fine. reppans and AF like this. I like the straight handle shape of the SR1 and the narrow profile it gives when folded. I found it comfortable to hold too. You also get a choice of blade shape. For practical purposes I'd agree. Carrying and using, I'd pick the UH over the others. It's light, strong, cuts well and has a long, comfortable handle. yep. good call there.....a good choice also. forgot about that one. Agree. very comfortable with great blade grind.